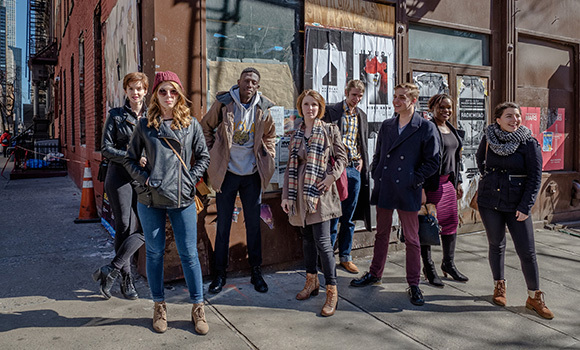 UNCG Theatre students strike a pose on the streets of New York. There’s no business like show business, and UNCG School of Theatre students found out first-hand as they traveled to New York City for the 19th annual Industry Showcase this week. The event is a unique opportunity for soon-to-be graduates to perform in front of top entertainment industry producers, agents and casting directors – and network with alumni who have found great success. Senior Bailey Gray Keith performs at the Alvin Ailey American Dance Theater. Not only was the Industry Showcase a transformative experience for the 17 students looking for their big break, it was an opportunity for scores of UNCG alumni and friends – hosted by Chancellor Franklin D. Gilliam, Jr. and Dean Alexander – to be treated to a host of experiences only New York City can offer. From Broadway shows to musical performances at the Metropolitan Opera House, it’s a week where lifelong memories are made. 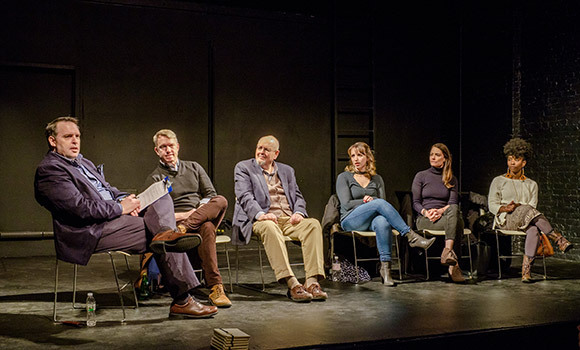 At an alumni roundtable, Tony Award-winning Broadway producer Hugh Hysell ’88 BFA (Phantom of the Opera, Pippin, Pirates of Penzance, The Fantasticks), actress Jennifer Mann ’16 MFA (The Disappointments Room with Kate Beckinsdale, Netflix series House of Cards), scenic artist Joe Forbes ’76 BFA (300+ Broadway productions; Carousel, School of Rock, Dirty Dancing, Hello Dolly! ), and others shared stories of their careers, tricks of the trade and the impact their UNCG education has had on their success. Alumni share the stories of their success. Tyler Barnhardt ’15 BFA (Underground, Bull, Scorpion) was scheduled to participate on the panel, but had to cancel at the last minute. He got a casting call to be in a TV pilot for NBC. Later, more than 100 alumni and friends joined Chancellor Gilliam at the Alvin Ailey American Dance Theater for a special performance of the Industry Showcase. Students displayed a wide range of skills – including singing, dramatic acting and comedic performance – that demonstrated the depth and breadth of the talent coming out of UNCG’s School of Theatre. 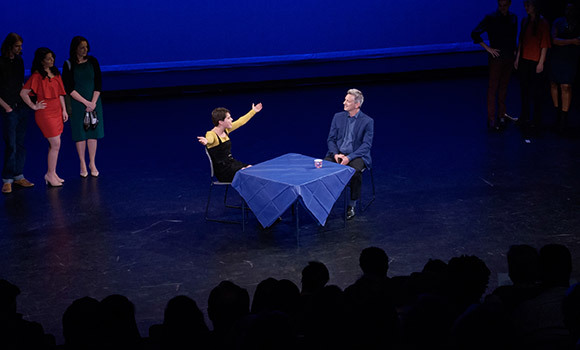 On Tuesday and Wednesday, students showcased their talent to members of the entertainment industry during two performances at the Lion Theatre on 42nd Street’s Theatre Row. They are following their dreams and taking Broadway by storm, like true Spartans.